Those of you with Mac computers already know that it is difficult to find Windows programs with Mac versions that work on your computer. 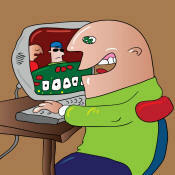 When it comes to online poker, nothing changes - almost every poker site only caters to Windows users. This is a huge problem for poker players with Macs, so we took the liberty of finding the best Mac poker sites so all of you have somewhere to play online poker. Both Bet Online Poker and Pokerstars (no usa players) have Mac-friendly poker software, while 888 Poker has a Flash poker room that Mac users can play on directly from their web browser. If you want to play poker on a Linux, check out this site for a complete list of Linux Poker Sites.Bet Online's and Pokerstars's Mac programs are exactly the same as their Windows programs, and have exceptional graphics and game play. Ignition's flash poker room is the same as their downloadable room, so Mac users will get the same experience as Windows users. Like I mentioned before, there are three primary ways to play poker on a Mac. They are to download Mac friendly software, to play at a Flash poker room, or to use a PC emulator. All of them work perfectly fine, but each of them have their own advantages and disadvantages. We'll discuss each of these options now. 888 Poker is our #1 Mac compatible poker room. Although this poker site does not accept USA players, they do provide one of the easiest clients to use and is available in over a dozen languages. 888 Poker's software operates using Flash, meaning you don't need to download any software. Click the "Instant Play" button on their website and your ready to go. New players joining through our site will automatically receive a free $8 instant bonus. The bonus is available as soon as you create your new account. On top of the no deposit offer, players qualify for a 100% to $600 deposit bonus. Bet Online is a new US-friendly poker room offering a custom Mac ready poker client. The poker room is the only site offering an instant bonus with your first deposit. Join Bet Online through Pokersite.org and receive 25% instantly. Bet Online Poker is part of the BetOnline.com brand, which also includes an online casino and one of the leading sports books for US players. The Mac software is only available as a download and provides all of the features and options the Windows version includes. William Hill Poker recently launched a Mac poker client using no download software. This means you create your account, deposit and play poker all within your internet browser. William Hill Poker is one of the top three poker rooms listed on the iPoker Network and is backed by award winning Playtech software. The software is supported in a dozen languages, accepts multi-currency play and is feature rich. As part of their welcome bonus, all new players joining William Hill Poker using the bonus code TOPBONUS will receive a 200% bonus up to $2000. Party Poker is an excellent option if your looking for a solid poker room with Mac compatible software. The Mac poker room is accessible via the "Instant Play" button located on the PartyPoker.com website. Once clicked, a new window will open asking you to create an account. Use our Party Poker bonus code 500PS during sign up and receive a 100% to $500 bonus when you make your first deposit. The Party Poker Mac software operates with Oracle Java SE 5.0 and above and includes most of the same features as the Windows version minus; Table filters, private tables, dealer options at the tables, and table resizing. Overall, the software is a fully functional program and meets player expectations. The easiest method for playing online poker on a Mac is definitely to download either Bet Online Poker's or Pokerstars's Mac-specific poker software. The programs will always be on your Mac, one click away, and you won't have to open up our web browser every time you want to play poker. If for some reason you can't download the Mac software, the Flash version is still a viable option. One drawback of downloading the software is that you'll have to use disk space on your computer, and that you'll have to download weekly updates from the poker room every time they update the software. However, these are small prices to pay for the convenience of a downloaded poker room. Flash poker rooms allow you to play online poker in your web browser without downloading any software. Although Mac users can't run Windows programs, they can still visit websites, so this is a perfectly suitable option for a poker player on a Mac. Some advantages of using flash software are that you don't have to waste any disc space on your computer, and you won't have to download updates for the poker room because you'll always be playing on the latest version. Flash poker sites are also the best option for playing poker on Linux. However, some drawbacks of using flash software are the fact that you usually won't get have as nice of a visual experience, and the software may be slightly jerky and not as smooth as a normal downloaded room. PC Emulators allow players to run Windows-only software on a Mac computer. Basically you are running a version of Windows on the Mac, and running the Windows program through the Windows operating system. One drawback to these programs is the fact that some have a price tag attached to them. Boot Camp is Apple-designed software that is included in the Leopard operating system. It allows Mac users to easily install a Windows operating system on their Mac, while still keeping the Mac operating system as well. This software is free with any Mac computer. Many players always ask us, "Is Mac Poker software any good?" Well, the answer is that it depends. If you play on a downloadable Mac poker room, you're guaranteed to get a great experience that is the same as what the Windows players are getting. However, if you play at a flash poker site you're probably getting a lesser experience then a player who is playing at the same site but using the downloaded Windows software. Also, if you're on a Windows emulator you might lag a little because of the emulation, but it still is fairly good overall.